My name is Sterling Demchinsky but most of my Ukrainian friends call me Slavco. 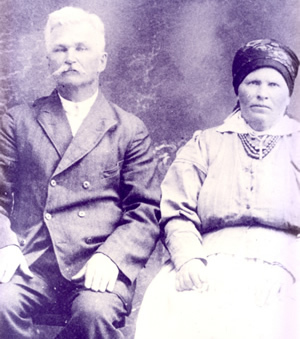 My ancestors immigrated to Canada during the earliest period of Ukrainian immigration. My great-grandparents were all born in either Halychyna (Galicia) or Bukovyna in villages that would now be in the western part of the modern nation of Ukraine. At the time of immigration, however, these places were all part of the Austro-Hungarian Empire. by the 1920s (photo courtesy of my mother). My grandfather and grandmother were born in a frontier land that was then called the Northwest Territories but eventually became the prosperous province of Saskatchewan. They grew up living in the typical two-room log houses with thatched roofs that most Ukrainians made, based on styles from the old country. When my grandparents married, they built a thatched-roof house for themselves, too, but by the mid 1920’s they could afford to build a real wood-frame house with a shingled roof. 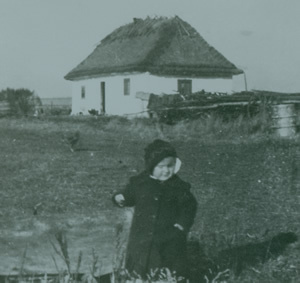 My family had gone from being Ukrainian peasants to being Canadian farmers. I was born in the late 1950s in Flin Flon, Manitoba. My parents both come from the vicinity of Canora, Saskatchewan but in the 1940s they separately moved to Flin Flon to find work in what was essentially a mining boomtown. They struck up a relationship and were married in 1950. 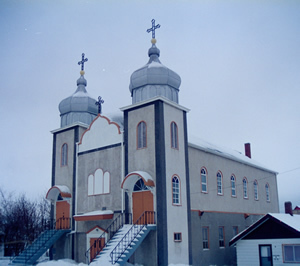 The last of four children, I was baptized in St. Mary’s Ukrainian Catholic Church in Flin Flon. I flirted with other religions, particularly with the Anglican Church. More seriously, I had a long period of being a backslider in which I rarely saw the inside of a church. Then, through a period of complex circumstances, I discovered that my life had a really big hole in it. That was when God called me back to the Church. After considerable meditation, I concluded that the Orthodox Church would be the best home for me because I was confident with it on so many levels. For me, the Orthodox Church is totally complete. house (photo courtesy of my mother). Living in Ottawa, I started attending Holy Trinity Bukowinian Orthodox Church, which was then a parish within the Orthodox Church in America. Most of its parishioners were ethnically Ukrainian but most of them were also getting on in years and the membership had fallen significantly since the days when it had been the first and only Orthodox parish in Ottawa. The parish saw hope in the form of a sort of “death and resurrection”. 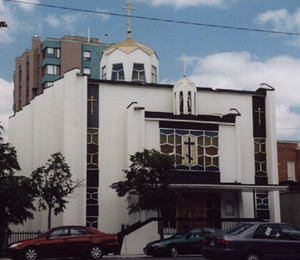 Holy Trinity Bukowinian Orthodox Church gave all of its considerable assets to a relatively new parish called Christ the Saviour Orthodox Church that was, at the time, renting space in an Anglican church. Holy Trinity Bukowinian Orthodox Church no longer exists but its legacy lives on in Christ the Saviour Orthodox Church. The two parishes combined their assets to make a new enriched parish that now has a vibrant, diverse, membership and a dynamic priest backed by a bright young deacon. The parish is now ethnically mixed with a growing membership and services are mostly in English. Our parish has a large number of converts to Orthodoxy. Finally, the growing number of young children in the parish gives us hope for the future. This is essentially a good news story, although I expect the idea of giving up ethnic identity in ones church would be a bit scary for some Ukrainian-Canadians. However, so many Ukrainian parishes, both Catholic and Orthodox, have dwindled to the point that they may only have a service once a year. Many more no longer have services at all. Of those Ukrainian parishes that still do have services regularly, a considerable number are facing the question of demographics. If the majority of parish members are over sixty-five years of age now, where will the parish be in ten or twenty years from now? This brings me to one of the primary reasons that I photograph Ukrainian churches. So many churches are in danger of closing. They deserve to be documented as a symbol of our heritage and as a monument to our pioneer ancestors. Of course, when there are new vibrant Ukrainian churches in Canada, they deserve to be documented too — if for no other reason than that we need to see examples of success more than ever now. 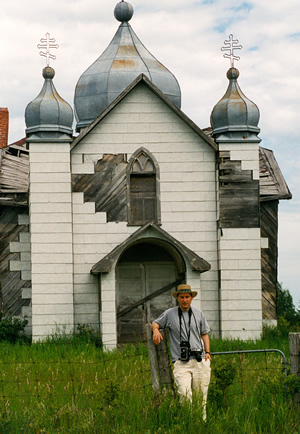 Sometime in the mid-1990s my brother, Bryan, and I realized that we were both interested in architectural photography and the photography of Ukrainian Churches in particular. We started pooling our resources and have spent many vacations photographing Ukrainian churches together. Once we even spent a few weeks photographing Ukrainian churches in Poland and Ukraine. After taking thousands of photographs, I want to share some of the results with all who love Ukrainian churches. © Sterling Demchinsky 2010. All rights reserved.